Success in the Crazy-Busy Sales World? It’s a SNAP! “How are you?” says the sales professional. “I’m crazy-busy right now and don’t have time to talk.” says the prospect. Sound familiar? Making productive contact with prospective buyers is as tough as its always been…or tougher? 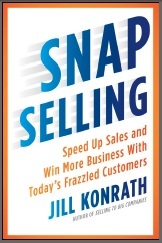 Jill Konrath, sales expert extraordinaire, tackles the topic of how to get more time and opportunity with today’s crazy-busy buyers in her latest book, SNAP Selling. Jill’s subtitle is “Speed Up sales and Win More Business with Today’s Frazzled Customers” – how appropriate! I was privileged to have a before-publish copy of the book and highly recommend you pick up a copy – and then read and apply the information NOW! I’m not alone in my praise for the book – its been the #1 sales book on Amazon for weeks! Have you ever felt that what you’re selling is just like what your competitors offer? Well, if you think that, imagine how your prospects feel. They get multiple calls every day from sellers who are all saying the same thing. Have a deep understanding of their business challenges. Continually bring them suggestions and insights. In today’s business environment, YOU are the primary differentiator – not your products or services. When you focus on developing and leveraging your own expertise, you’ll start seeing immediate results. Just ask Bill. When he moved into sales at a printing firm where he’d worked for years, he thought the transition would be easy. But after leaving over 2,500 voice mail messages, he was getting nowhere. His prospects rarely answered the phone. And, when he left messages, they never called him back. Bill was getting desperate – until the day he decided to embrace the approaches detailed in SNAP Selling. What did he do first? He decided to quit selling “printing.” It just wasn’t working anymore. Decision makers were simply not interested in talking to another printer who offered one-stop shopping for all their needs combined with great customer service. Their current provider was fine and their pricing acceptable. Bill’s next step was to narrow his focus. But in what area? After reviewing a variety of projects that his company had done over the years, he decided to become a menu expert. This is an incredibly hard decision for sellers to make – especially when business is bad. But it is necessary in order to increase your effectiveness. With this new identity, Bill immersed himself in the restaurant industry. He learned the lingo, studied the history, analyzed how big restaurant chains worked, examined their challenges, and read everything he could on the topic of menus. Then he targeted the companies he wanted to land as clients. As he studied their menus, he discovered ways that he could help the restaurants improve them, possibly in ways they’d not yet perceived. He followed the trade press to identify potential opportunities for new menu sales. He looked for chains that were lowering their prices, expansions into new markets, announcements of new menu offerings, and more. When he noticed these trigger events, he’d get in touch. Fresh new ideas about how he could help. Things started changing almost immediately. Bill was soon engaged in interesting conversations with the marketing people. They talked about how to energize offers and drive revenue growth with newly designed menus. The “how much” question was barely a consideration. Meanwhile, his competitors were fighting pricing battles with the supply chain people. Because they were viewed as a commodity, they were discounting like crazy. The results? In just two years, Bill’s company has printed over two million menus for the country’s best-known restaurants. He’s in active discussions with his top one hundred targeted restaurants. He’s blowing out his sales numbers and having more fun than ever before. And he’s expanding his expertise into his next target market right now – but I’m sworn to secrecy and can’t reveal it. That’s why one of the four SNAP Rules is to Be iNvaluable. 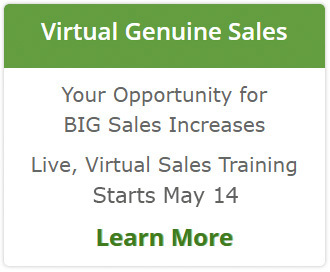 In today’s marketplace, it’s imperative for sales success. Even if your company offers a wide product line or a variety of services, you can still chose to become a specialist – just as Bill did. While it requires an upfront time investment, the payback can be huge. Jill Konrath, author of SNAP SELLING and Selling to Big Companies, helps sellers crack into new accounts, speed up sales cycles and win big contracts. She is a frequent speaker at annual sales meetings and professional conferences.